Since the industrial revolution, our economies have grown at the expense of the natural world. But as pressure mounts on the earth’s finite resources, we can no longer pretend that business-as-usual is a realistic option. One way or another we will have to change. The longer we delay, the more our societies will be at the mercy of events and the harsher the eventual adjustments. 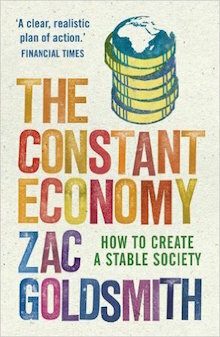 There is an alternative: a constant economy. A constant economy is one in which resources are valued not wasted, where food is grown sustainably and goods are built to last. It is a system whose energy security is based on the use of renewable sources, and where strong communities are valued as a country’s most effective hedge against social, economic and environmental instability. The constant economy operates at the human scale and, above all, it recognises nature’s limits. The author shows that almost everything we need to do, is already being done somewhere in the world. Where governments, communities or companies have done the right thing, they have been rewarded. Solutions exist, and they are brought together and set out in this ground-breaking book.